I Installed DotNetOpenAuth SDK-3.4.5.10201.vsix and I can't get it working. It works locally (when I run as localhost) but when i try to publish it ain't working. Migrate the configuration to the system.webServer/modules section. You can do so manually or by using AppCmd from the command line - for example, %SystemRoot%\system32\inetsrv\appcmd migrate config "Default Web Site/". Using AppCmd to migrate your application will enable it to work in Integrated mode, and continue to work in Classic mode and on previous versions of IIS. Alternatively, switch the application to a Classic mode application pool - for example, %SystemRoot%\system32\inetsrv\appcmd set app "Default Web Site/" /applicationPool:"Classic .NET AppPool". Only do this if you are unable to migrate your application. But the problem is that I don't have access to the ISS server as I am not the owner of it. Is there any way to solve this? The 2nd option is the one you want. This issue and the confusion surrounding it started with the introduction of ASP.NET 2.0 and IIS 7. IIS 6 had and continues to have only one pipeline mode, and it is equivalent to what IIS 7+ calls "Classic" mode. 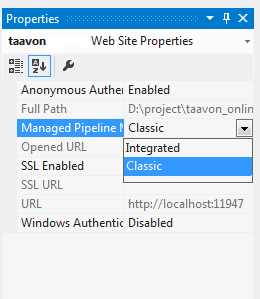 The second, newer, and recommended pipeline mode for all applications running on IIS 7+ is called "Integrated" mode. So, what's the difference? The key difference is how ASP.NET interacts with IIS. Classic mode is limited to an ASP.NET pipeline that cannot interact with the IIS pipeline. Essentially a request comes in and if IIS 6/Classic has been told, through server configuration, that ASP.NET can handle it then IIS hands off the request to ASP.NET and moves on. The significance of this can be gleaned from an example. If I were to authorize access to static image files, I would not be able to do it with an ASP.NET module because the IIS 6 pipeline will handle those requests itself and ASP.NET will never see those requests because they were never handed off. * On the other hand, authorizing which users can access a .ASPX page such as a request for Foo.aspx is trivial even in IIS 6/Classic because IIS always hands those requests off to the ASP.NET pipeline. In Classic mode ASP.NET does not know what it hasn't been told and there is a lot that IIS 6/Classic may not be telling it. Integrated mode is recommended because ASP.NET handlers and modules can interact directly with the IIS pipeline. No longer does the IIS pipeline simply hand off the request to the ASP.NET pipeline, now it allows ASP.NET code to hook directly into the IIS pipeline and all the requests that hit it. This means that an ASP.NET module can not only observe requests to static image files, but can intercept those requests and take action by denying access, logging the request, etc. If you are running an older application that was originally built for IIS 6, perhaps you moved it to a new server, there may be absolutely nothing wrong with running the application pool of that application in Classic mode. Go ahead you don't have to feel bad. You grow tired of removing the httpHandlers and httpModules that NuGet packages keep adding to system.web, hey do what you need to. If those options do not work or are more trouble than it is worth then I'm not going to tell you that you can't set validateIntegratedModeConfiguration to false, but at least you know what you're doing and why it matters. *Of course there are ways to get all kind of strange things into the ASP.NET pipeline from IIS 6/Classic via incantations like wildcard mappings, if you like that sort of thing. I ran into this issue but had a different fix. It involved updating the Control Panel>Administrative Tools>IIS Manager and reverting my App site's Managed Pipeline from Integrated to Classic. Check if there is any conflict in your IIS authentication. i.e. you enable the anonymous authentication and ASP.NET impersonation both might cause the error also. Delete the originally created site. Seems like something went south when I originally created the site. I hate solutions that are similar to "Restart your machine, then reinstall windows" without knowing what caused the error. But, this worked for me. Quick and simple. Hope it helps someone else. Removing this section got me past the HTTP 500.23!! In my case i was missing dll in bin folder which was referenced in web.config file. So check whether you were using any setting in web.config but actually don't have dll. It took me few hours to solved this because all off the settings that I found here about this error were the same but it still didn't work. The problem was tha I had a folder in my web service from which the file should be send to WinCE device, after converting that folder to an application with Classic.NetAppPool it started to work. Not the answer you're looking for? Browse other questions tagged c# asp.net iis .net-4.0 iis-7.5 or ask your own question.